This blog has not spent enough time focusing on the Labour party. Much of our time has been devoted to highlighting serious flaws in a party we wish was doing so much better, but is hamstrung by incompetent, rudderless and lazy leadership. But following the party’s actions and inactions subsequent polling shows that the momentum it built, before the 2013 local elections and its high point in winning council seats and polling above the Lib Dems, has ground to a halt. UKIP may have finally embraced Article 50, but a damaging combination of shallow intellectual base, poor political judgement and disgraceful misallocation of resources means the party offers little and can deliver even less. Its only relevance in 2015 will be the extent to which it damages the Conservatives and leaves the way open for Labour to form the next government. Depressing and frustrating for ‘kippers and those of us with anti-EU sentiment, but true. Ed Miliband getting the keys to Downing Street is a prospect that should increasingly fill people with horror. While over 70% of our laws and regulations are imposed by the EU, the remaining percentage of governance still controlled within these shores provides Labour with ample scope to cause substantial harm to this country. While there has been much talk of UKIP posing the main threat to Labour in the north, the reality is the ‘north’ is not a single entity. There are as many complexities, rivalries, jealousies and agendas in the north of England as there are constituencies. One size does not fit all. UKIP appealing to folk in Burnley for example, does not mean it therefore appeals in the likes of Wythenshawe, Sedegefield, Batley, Hemsworth, Blaydon and Wansbeck. Being opponents to Labour and not be Tories has not been sufficient for Lib Dems all these years and it won’t be for UKIP. The real battles in 2015 will be Conservative marginals, where unpopular government faces off against incompetent opposition that will cause real damage to this country if it is able to form a government. The Labour way is the wrong way and that is even before you factor in the increasing control being exerted by the trade unions, whose desires are increasingly out of kilter with the desires of ordinary people and families, and the fact the party is – to use that infamous expression coined in The Thick of It – disconnected to the point of autism. Labour held sway in Scotland and was so dire it was replaced by the pisspoor SNP, which has also managed the referendum campaign in such cack-handed fashion it is now likely to be beaten by dire Labour at the next election. The real losers however are the Scots people who see-saw between two cheeks of the same arse and see their country steadily deteriorate as the client state grows, outcomes decline and wealth creation dwindles. Then take Wales, where the Labour administration is getting some overdue, uncomfortable scrutiny from Daily Mail today. Even making allowances for the usual media errors, hyperbole and spin, the article still hits on many home truths about the Labour party and the way it operates in office. The key takeaway is that despite all the failings and incompetence highlighted and the attendant corruption that always accompanies Labour rule, Ed Miliband holds up Wales as an example of Labour in action. Miliband’s declaration that if a new EU treaty is presented to the UK during a Labour government, he would hold an in/out referendum rather than a yes/no on the terms of the treaty itself, looks like a gift to the anti-EU side. But it isn’t. It is a carefully constructed ploy to maximise the prospect of an ‘in’ vote and put an end to discussion about leaving the EU for a generation or more. The lines that will be taken in addition to the current unsubstantiated reasons for remaining a province of the EU are obvious… along the lines of ‘You wanted reform and here is reform’, ‘It would be overkill to leave the EU just because of this treaty?’. Combined with the fear, uncertainty and doubt that will be spun concerning alleged economic and employment impacts, even when countered, many voters will opt for a ‘safety first’ approach and stick with EU membership. So as you can see, it is not just Labour’s unique brand of spiteful, corrupt administration that will be brought about across the whole country by Miliband taking office in 2015, but also Labour’s insipid plan to destroy the anti-EU movement and cement the UK’s involvement in bringing about ever closer union. Labour has to be prevented from winning the next election. More thoughts on this soon. If democracy wins we all win. We cannot disagree with that sentiment. However Martin was not speaking of reforming the unaccountable legislative bodies of the European Union to make them democratic, rather he was talking to The Citizen in Tanzania about Sunday’s General Election where EU observers are acting as monitors. It never ceases to amaze me how an entity like the EU can send its bureaucrats around the world pontificating about democracy while its own political structures are themselves fundamentally undemocratic. We do not use the term “free and fair” as these are very subjective terms. What we will judge is the election against well established international norms and ask ‘’did the people get the government they voted for?’’. Well established international norms have regularly seen monitors benchmark an election by questioning whether an election it was free and fair. The EU’s change of language is a curious development. The EU does not make such changes unless it has a vested interest in doing so. Therefore we should be asking what benefit the EU will derive from this. Considering his unique role in destroying our economy and undermining the fabric of this country, it’s not a moment too soon. The SNP in Scotland has already said it would work with Labour. Plaid Cymru in Wales has worked with Labour before. Now the DUP and SDLP in Northern Ireland have signalled they would side with a Lib-Lab pact on a case by case basis to ensure taxpayers’ money continues to flow into the province. With Gordon Brown stepping aside, all the pieces are falling into place around Nick Clegg to prop up a new Labour Prime Minister. England, uniquely without its own national legislature, stands to suffer the consequences of this political stitch up. It would be a broad, ramshackle coalition only made possible by tax pounds from England being poured into Scotland, Wales and Northern Ireland as an ongoing bribe in return for votes in the House. In centuries past the people of what is now England paid the Danegeld – an Anglo Saxon tax to buy off the Danish invaders. Here in 2010 the Labour Party are preparing to pay a Celtgeld raised from English taxpayers to buy off the nationalist parties in the devolved countries to keep a Labour administration in office. New politics and national interest indeed. Breaking news on Sky… Electoral reform has been offered to the untrustworthy Liberal Democrats by the panicked Conservatives. A national referendum on the ‘Alternative Vote’ has been put on the table in a last ditch attempt by the Tories to prevent Nick Clegg climbing into bed with Gordon Brown’s successor. David Cameron is on the ropes and this is a desperate last gambit. The positive thing about the Alternative Vote is that the all-important constituency link is maintained. It is not proportional representation, which would break the direct accountability of MPs to their constituents. However Labour, in its typical undemocratic fashion, is offering the system without asking the electorate if they approve. Everyone wants to dance with Nick. He must be loving it. The voters however are an irrelevance as members of the political class rush around looking for ways to secure patronage and advantage for themselves. Gordon Brown to resign. Lib-Lab pact? England to be ruled by celtic coalition? It is no surprise that the smallest and least supported of the three main parties, the Liberal Democrats, have conducted their negotiations with the Tories while keeping back channels open with Labour. Despite having the smallest mandate of the three main parties, the Lib Dems are now the most powerful force in British politics because they hold an inordinate balance of power. It has become clear that the blocker to a Liberal Democrat coalition with the Labour Party was Gordon Brown because the Lib Dems do not like him. With Labour’s naked thirst for power uppermost in its considerations, the comrades in dark suits have successfully manoeuvred Brown out of the way to increase their appeal to the Lib Dems. The Lib Dem ransom demand looks set to be paid. The Conservative negotiation team that thought it held the best hand to win over the Lib Dems might find it has been playing a busted flush. It might be about to find out just what a mistake it was to entertain the idea of a deal with the most treacherous and unprincipled bunch of politicians this country has to offer. David Cameron could now find himself remaining leader of a huge opposition party. The real danger is Britain’s economic outlook as any coalition including Labour will continue to increase the public debt at a time it needs to be dramatically reduced. The real winner of this election would be the EU. So what now? 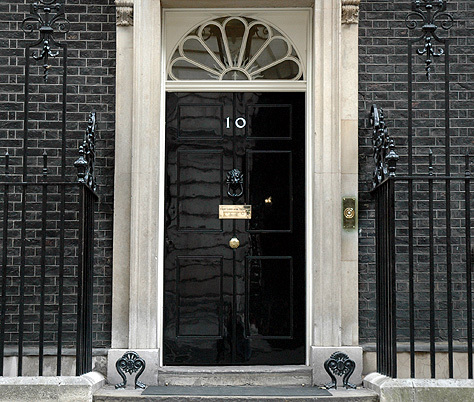 The prospect of a Labour Prime Minister remaining in 10 Downing Street has dramatically increased. The Lib Dems have held the country to ransom and will push the least popular agenda of the three main parties onto the business of the House, where a grateful but defeated Labour Party will vote them through as the price of keeping power. There is a big question people should be asking now. How do these political power games played out by the political class serve the interests of voters? But the biggest question of all is this. What would the Lib-Lab-SNP-PC coalition that’s being mooted mean for England? The democratic deficit suffered by England due to it having no national legislature could dramatically widen into a chasm if such a coalition assumes power. It would mean legislation is foisted upon England by a government comprised of Scottish and Welsh nationalists, possibly with the aid of Northern Ireland’s Democratic Unionists. If Clegg and Labour agree a pact, how will England’s voters – who thought they had defeated Labour – react to being led by another Labour Prime Minister and having legislation imposed on them by MPs from other countries? One thing we can be sure of, while Cameron would have been bad for this country, a Clegg-Miliband/Balls/Harman axis will be an utter disaster. That is the latest statement from William Hague, speaking on behalf of the Conservative Party team engaged in discussions with the Liberal Democrats. One wonders what the Butcher’s Bill will be in terms of culled manifesto commitments when a deal is finally thrashed out. One thing is certain, if a deal is made then Conservative and Liberal Democrat voters are not going to get what they thought they were voting for. No one knows what is being agreed behind closed doors. It is politicians, not voters, who are deciding what commitments are dropped. There os no accountability to the electorate in this process. Power continues to reside with the political class, the voters are nothing more than ignorant observers in this process. This is the common consequence that can be expected if proportional representation is adopted as the electoral system in this country. Too many people look at the election results and say that because across the country a party achieved a certain percentage of the vote, they should have that percentage of Parliamentary seats. It’s nonsense. Parliamentary elections are where constituencies vote for the person who will represent them in Parliament. Quite properly the person with the most votes wins. People who vote for candidates who are not elected have not been disenfranchised at all, they were merely backing a candidate who was rejected by most people. If they do not like the outcome they should understand that their agenda isn’t sufficiently popular. It is wholly unacceptable that a small collection of like minded constituencies should be able to force the wishes of a majority of constituencies to be compromised. PR is just a vehicle for giving those holding the least popular views the whip hand over those who hold the most popular. Yet it is presented as democratic to make it seem acceptable. The constituency model is essential to our democracy but PR undermines that. The electoral reform that is needed is that which prevents electoral fraud from being perpetrated and that equalises the number of people in each constituency. PR is not needed to achieve that. Most of the media is focused on the political mating ritual being played out between the Conservatives and the Liberal Democrats. However, Steven Swinford in the Sunday Times manages to drag some readers back to a more fundamental problem in the British democratic process, for the zero sum game of ‘how many of my stated principles can I get away with abandoning’ is far less important than the endemic problems at the heart of our voting system. OFFICIAL election monitors from the developing world have warned that the British voting system is less secure than their own and possibly the most vulnerable to corruption in the world. Observers from Kenya and war-torn Sierra Leone, who spent the past week in Britain, said the integrity of the general election was at risk because it was based on trust rather than proper identity checks. They questioned the legitimacy of the result after thousands of voters were turned away from crowded polling stations. The observers were also shocked by allegations that the electoral roll was being filled out with “ghost” voters. To cut to the chase, what this tells us is that the corruptible British electoral system, which enables non-existant people to be registered to vote by post and no checks made as to the identity of electors, denotes the United Kingdom as nothing more than a Banana Realm. It didn’t take long for many in the media, with their tiny goldfishesque attention spans, to forget all about the postal vote scandal and focus on the political class theatre playing to a bemused population. To cap the humiliation, just see the comments made by some of the observers. When the Cameron-Clegg tango is done and dusted and the UK is saddled with a principle-lite coalition of compromise and abandoned pledges, this realm will still be considered by the international community to be an example of electoral incompetence that is incapable of delivering fair and trustworthy elections. This General Election has seen the Conservative and Unionist Party confirmed as an English political party. Of the 10,706,647 votes cast for the Conservatives across the United Kingdom, 9,911,062 were cast in England. The Conservatives currently hold a clear majority 297 of the 533 English Parliamentary seats (with one seat yet to elect an MP). In the devolved countries – Scotland, Wales and Northern Ireland – out of a possible 117 seats the Conservatives won a paltry 9, securing just 795,585 of the 4,606,283 votes cast. Despite this level of support in England, the Conservatives unbelievably plan to continue treating England as a second class country within the United Kingdom. England alone has no national legislature. England alone is forced to accept governance from the UK Parliament. The Scots, Welsh and Northern Irish legislatures control major areas such as health, education and transport in their countries with no outside interference. Those same core governmental areas in England are controlled by Westminster, with MPs for Scottish, Welsh and Northern Irish constituencies detemining how England is run, safe in the knowledge that what they decide to impose on England will not affect their own constituents. The Conservative plan is to allow MPs for English constituencies to look at Bills ihe early stages before putting them to the vote in the House of Commons – where the Scots, Welsh and Northern Irish will continue to have the fundamentally undemocratic ability to vote on them. You might be asking yourself why, given this has been known for a while, has the need for an English Parliament has suddenly become more urgent? The reason is the outcome of the General Election. David Cameron, in his desperation to become Prime Minister, has offered the Liberal Democrats the chance to govern with the Conservatives in a coalition. If the proposal is accepted, it would be a political shotgun wedding and become a fractious marriage. There will always be the possibility that the Lib Dems will walk out of the relationship, abandon the Conservatives and set up home with Labour, with whom they are more compatible. If this happened, Labour and the Lib Dems would secure the support of the Scottish National Party (SNP), the Party of Wales (Plaid Cymru) and almost certainly the Democratic Unionist Party (DUP), Social Democratic & Labour Party (SDLP) and Alliance Party MPs from Northern Ireland. The combined votes of these parties would be 336, giving this grouping a majority in the Commons. Their legislative agenda in Westminster would, by definition, affect England more than the devolved countries because England does not have the degree of self determination granted to the other countries. In such circumstances without power being devolved from Westminster to an English Parliament, major polices concerning health, education and transport among others, would be imposed upon the English through the votes of MPs from outside England, representing parties that have not stood for election in English constituencies, or parties that have been overwhelmingly rejected by English voters. The situation differs from the last Parliament because Labour had more MPs in English constituencies than the Conservatives. But now the position is very different. The imposition of legislation on England that can only be made possible by the votes of non English MPs is a very real prospect and something that would be completely unacceptable. The Conservatives need to act swiftly to present a Bill to form an English Parliament that could properly protect the interests of the English, before the possibility of the Tories being turfed back into ineffective opposition. The voters have spoken clearly and demonstrated they want the political parties to work together. Well, according to Ed Miliband at any rate, as he held forth in front of TV cameras without the supervision of a responsible adult. Miliband made his idiotic comment despite there being not one voter who had a ballot paper where they could mark an X to vote for coalition government or cross-party cooperation. Voters went into polling stations (if they arrived in good time and there were ballot papers available) to chose the MP or the political party they most supported or least disliked. The absence of a definitive outcome is frustrating many voters, many of whom are wondering what the hell is going on. Why, many are wondering, having clearly lost the popular vote and not secured the largest number of seats, is Gordon Brown is still taking power naps in Downing Street? Welcome to the future that awaits Britain in just about every future election if the first past the post system is scrapped in favour of proportional representation. We are already conditioned to put up with bad government, but now we can expect weak government too. Government where minority parties force the majority party to abandon manifesto pledges that earned it enough votes to become the largest party. Government where the part of the legislative agenda not offshored to the EU can be dictated by the least popular parties, whose policies only resonated with a limited number of voters. There has been a great deal of discussion about the Lib Dem position on voting reform and Nick Clegg has repeatedly asserted that people were in the mood for change of the electoral system to proportional representation. But the outcome of this General Election has laid bare the extent of political uncertainty, backroom horsetrading and party political vested interest that comes with such a system. How days and weeks of secret deals determine how we will be governed. If voters feel uneasy now, imagine how they will feel when nearly every election results in the vested interests of the political parties coming before the wishes of the people outside the political bubble. How will voters feel when they finally discover that PR will result in sterile party politics where the elected representatives are in hock to the party, not the electorate? Need a good example? Take a look at politics in Greece. Yes, welcome to the future. If good intentions pave the road to hell, PR is one of the pavement slabs. As expected, it didn’t take long. The reports of Conservative MPs issuing warnings to David Cameron not to make a deal with the Liberal Democrats without first consulting them are already surfacing. As the Mail claims, disgruntled backbenchers are voicing scepticism at Cameron’s plans for an agreement with Nick Clegg and have urged him to change his leadership style, complaining that key decisions are taken by a clique around the leader. Their complaints are somewhat hollow given that Cameron has long implemented a fundamentally undemocratic centralised and controlling approach. The position the political parties now find themselves in is laughable. Having spent months telling us how very different they all are, the parties have now been forced to publicly tell each other just how much they have in common, as they seek to jockey for advantage in order to secure positions of power for themselves. Now is an historic opportunity to reform politics for the better, to open up politics and government, to roll back an authoritarian state. If the Tory right is too small minded to allow Cameron to do a deal with Clegg then they are as stupid as they are short-sighted. This is an historic opportunity to realign politics along a liberal-conservative axis. It is the chance to destroy the Labour Party as a party of government forever. If the price is real reform of the electoral system then that is a price well worth paying to free us from the economic destruction wrought time and time again, decade after decade, by a statist, big government Labour Party. Guido’s got it badly wrong. Neither party is of the classical liberal school of thought. Both still have an authoritarian bent that is exhibited in modern liberal thought. Aligning politics along the axis of these two parties as they currently stand will still result in statist big government. It might neuter Labour, which would be no bad thing in itself, but it won’t result in a wholesale rolling back of the state or properly restore individual freedom and liberty for the ordinary citizen. It won’t result in a restoration of national sovereignty. The country still requires a genuine and principled, centre-right, democratic conservative alternative that doesn’t just make passing reference to individual freedom and limited government, but will actually deliver it. Any Conservative coalition with the Liberal Democrats will cement the vacuum that exists to the right of centre, a vacuum that is reinforced by the strictly limited appeal of UKIP. The time has come for a Democratic Conservative alternative that talks to the issues that matter to voters and embodies a genuinely new politics, rather than the imitation, sham version offered by Cameron and Clegg. Britain found itself – quelle surprise – oddly reluctant to get in any way enthused by Dave’s bouncy new “Big Society” plan for teenagers and grandmothers to be compelled every other week to whitewash their local community centre. That’s because what Britain really wanted – and definitely needed – was a charismatic leader more akin to Margaret Thatcher. Someone capable of restoring Britain’s economic efficiency and rolling back the state; someone who, instead of wittering on about how much they cared about the NHS, might understand the needs and aspirations (which Cameron doesn’t and never has) of the hard-working middle classes; someone who valued the principle of liberty and realised just how much of it we’ve lost in the last 13 years; someone unafraid to address issues of concern to so many people such as immigration and the growing power of the European Socialist Superstate. Cameron would have been quite capable of doing all this. But because he has no real personal ideology – as is the way with rich toffs in Conservative safe seats – what he badly needed was advisors capable of pushing him in the right direction. In this he has been badly failed. Many Tories will be desperately focusing their attention on whether Cameron can scrape into Number 10 as PM in a minority government. In the background however, many will also be mindful that Cameron, with his style over substance and absence of principle took an overwhelmingly winning position and threw it away because of his distinctly unconservative and myopic devotion to the concept of political union within the EU. The hung parliament outcome is a testimony to the impotence and lack of appeal of the Tory wets. The Conservative Party and the country needed a new Margaret Thatcher. It got another Ted Heath. Most of the results are in and the Cameron Conservatives have come up short in their quest for an overall majority in the House of Commons. But forget 6th May 2010. 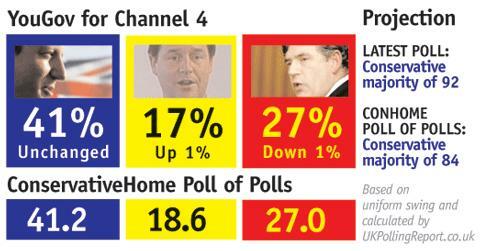 This General Election result became possible as far back as 1st November 2009. Make no mistake, the single most important issue that contributed to Cameron being denied an outright win overnight was his decision in November to ‘let matters rest there’ with regard to ratification of the Lisbon Treaty. For me personally, it was the day I made the decision to leave the unprincipled Cameronised Conservative Party. The arguments have raged back and forth since that day. 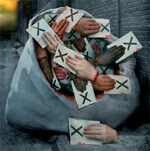 Many people have sought to give the impression that Cameron’s hands were tied by the ratification. Therefore, they contend, he had no option but to abandon his pledge to empower the British people to say whether or not they would permit the export of significant power to the EU. Many voters haven’t bought that spin. They know all to0 well that a referendum could still have been held giving Cameron a mandate to abrogate from the terms of the Treaty. Cameron chose the easy way out and denied the people an entitlement to approve Lisbon or throw it out. Of course, since then the Conservative poll standings have gradually withered away as voters rightly classified Cameron as just another untrustworthy politician. For weeks the polls have shown the Conservatives with a 6-7% lead over Labour, on around 36% – and that is exactly how the voting has stacked up. It’s an incredible contrast and evidence of a defeat snatched from the jaws of victory. The only person responsible for the outcome we have seen today is David Cameron. Now it remains to be seen what behind the scenes deals can be struck by the party hacks. With Nick Clegg apparently reconfirming his ‘will he – won’t he’ commitment to allowing the largest party to form a government, it seems Cameron could have a lifeboat with which to reach Number 10. However, Cameron will be reliant on the support of other parties in order to govern, which could result in the kind of weak and ineffective government that often accompanies coalitions. But the shenanigans are not over yet as the fall out from postal voting fraud, and the people left queueing without being able to vote, is yet to land. Now, as the political class plays its backroom games and the electorate is left mystified by the uncertainty of what’s going on, only one thing is certain – Westminster will become the scene of messy deals and policy fudges that serve the interests of the political class, not the voters. The only thing that is certain is that no one, not a single political party and not the electorate, have won the 2010 General Election. Maybe we will soon be required to do it all over again. Lucky us. With the BBC’s immediate exit polls suggesting the Conservatives falling short of an overall majority by 19 seats (based on a uniform swing nationally) the plotting and scheming is underway in earnest. Will the Conservatives be forced to attempt to form a minority government? Will Brown and Clegg stitch up a Lib-Lab pact. 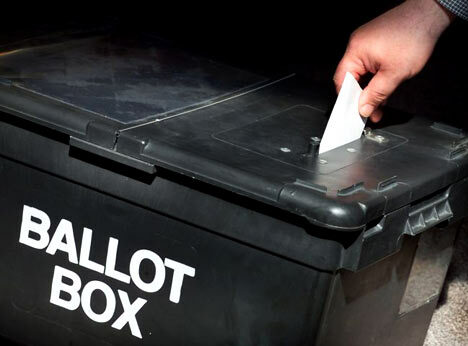 Reports also from the BBC in Sheffield Hallam suggest some people were turned away from a polling station at 10pm having been unable to vote due to the numbers of people wishing to participate in the poll. One wonders if the term Banana Republic will figure this night. No, not Labour and the Conservatives for once. I am talking about the two sides of a different coin who demonstrate tolerance only of their own intolerance. The two sides in question are the British National Party (BNP) and Hope Not Hate, which are frankly as distasteful and spiteful as each other. The latest example stems from a street brawl in Barking, east London, between BNP candidate Bob Bailey and some Asian youths, which is getting media attention. Bob Bailey’s reaction contrasts with that of most other politicians (excluding that moronic dinosaur, John Prescott) who have been spat at or had eggs thrown at them. Most others, despite the evident provocation and their disgust or anger, maintain their dignity and control themselves. Bailey’s reaction however just makes the whole thing worse and demonstrates a questionable character. What is clear is that the intolerance and deceit of the BNP is matched only by the intolerance and deceit of people like the author of ‘The Duck Shoot’ blog. Neither side comes out of this with any credit. They are two cheeks of the same arse. A plague on both their houses.